I am a major proponent of all kinds of Japanese food, from the highest of haute cuisine from Kyoto ryotei to the humble fare available at a konbini (convenience store). Over the years, I've tried to introduce you all to all kinds of Japanese flavors on these pages, from the traditional to the new. One great thing about Japan for food lovers that you can get interesting and tasty things to eat at all price levels. For instance, here in France you can of course get terrific food at the high end, and pretty good food in the mid-end. Some staples, like bread, are usually terrific. But mass-produced supermarket-level stuff tends to get very iffy. Japan has its share of supermarkets and convenience stores and icky mass-produced food too of course, but you can still get a lot of great things at the lower end of the price spectrum. Japanese candy tends to taste really good, at least to me. Everytime I'm back in Japan, I stock up on my favorites and try some new things. My secret forbidden stash of candy is about 90% Japanese*. The Japanese market tends to be quite adventurous when it comes to rather unusual flavors, so you get things like rose-flavored gum and hard candy that tastes like beef, not to mention cherry-blossom flavored ice cream (in the spring) or sweet potato flavored puddings. All a lot of fun. Which brings me to the Japanese candy product with unusual flavors that gets the most attention overseas: flavored Kit Kats. I suppose they get so much attention mainly because they're an international brand (originally produced by Rowntree's in the UK, now owned by international confectionery behemoth Nestlé). Business publications in particular seem to be fascinated by them; when NPR did a story about them, it was by focusing on the business and marketing aspects (though the accompanying story has the staff sampling various Kit Kat flavors). They're one of the things that a lot of people interested in Things Japanese (especially the anime and manga set) seem to want to try. If you can't make it to Japan, you can buy flavored Kit Kats from various mailorder places that sell Japanese products - at a premium of course. But, are they worth it? Well, no. Flavored Kit Kats are really all about the novelty value, and the packaging, and the strange urge that takes over some people to Collect Stuff. Let's look at one of the more fun flavored Kit Kats that came out last year. The box is shaped like Fuji-san (Mount Fuji), the most iconic mountain (actually an active volcano) in Japan. This was a special limited edition that was only available for sale in the areas around Mt. Fuji, namely Hakone. If I recall correctly, it costs a whopping 800 yen. But it was so cute I couldn't resist. The packaging proclaimed that the Kit Kats within were Blueberry Cheesecake flavored. Now, having tried other flavored Kit Kats in the past I was quite skeptical. Still...who could resist that packaging? Inside the volcano, I mean, box, were 9 mini-sized Kit Kats. Here's how most flavored Kit Kats look. The base for these flavored offerings is usually white chocolate, since it's more neutral than milk or dark chocolate. The white chocolate is sometimes dyed to match the purported flavor (green for matcha tea, yellow for banana, etc.) but in this case they didn't dye the Blueberry Cheesecake Kit Kits blue. Phew. So...how do they taste? To be frank, disgusting. And that's really not surprising, if you think about it. 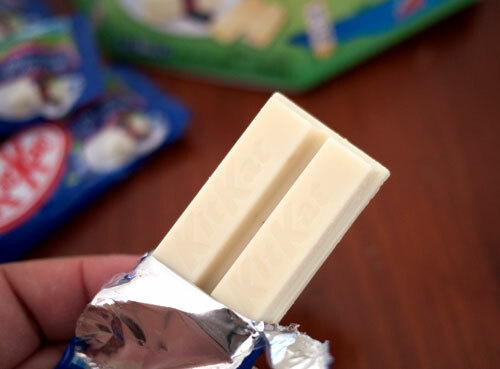 Flavored Kit Kats are based on cheap, nasty white chocolate, with cheap, nasty artificial flavors and colorings**. With the constant pressure (I presume) to produce new flavors, the quality control may not be quite there. Plus, most of these flavored Kit Kats are limited-editions, so if people are particularly grossed out by a particular flavor no problem - it's just not made any more. There's a whole market in Japan for something called shokugan, which means "food toys". Shokugan aren't edible toys, or toys shaped like food (necessarily) - it means the extra thing that you get with food. The 'surprise' in a box of Crackerjacks or a box of kids' cereal is a shokugan. In some cases, the surprise itself has become so major that the candy is an afterthought. The Re-ment company, for example, makes very detailed shokugan toys and other things, that come with a nominal piece of candy or gum. (Previous Re-Ment.) Clearly the draw is not the edible part, but the shokugan. In a way, flavored Kit Kats are bordering on shokugan - they're sheer novelty items. If you expect them to taste good, be forewarned that they emphatically they don't. Of course, they do make great gag gifts for the folks back home, especially if the are not food people per se. Submitted by maki on 2011-09-21 10:02. Fascinating! I admit to being a fan of green apple HiChew (they even have the multi-flavor pack at Costco! ), and those cola-flavored chewy candies! And ume-flavored candy with a soft, sweet/sour/salty filling. That's nothing . I saw a PINE flavored kitkat from South Africa ! I have to agree on the mass-produced thing in France. Whenever I hear people gushing about "having a picnic in Paris with lunch/sandwiches bought at monoprix" my stomach turns a bit, and I wonder if the supermarket food in their country tastes even worse. 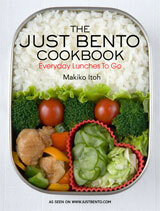 But in Japan, I had a few good konbini bentos. But I didn't try the stuff they kept in a heated glass box on the counter, some dumpling things? They looked too greasy. Japanese candy was a hit or miss for me. I usually liked chocolate stuff, and the gummy bear type of candies. Some of the mints I got were too achingly sweet for my taste (but came with cool stickers so still a win :D). And then some of the more "artisanal" candies (local specialty) were completely tasteless. Like balls of... jello? with no flavor. I totally would have bought the Fuji-san kit-kat box too, I love the packaging. Also, it makes a great regional souvenir. I was wondering if you could write about the local food souvenir thing in Japan sometime? I noticed there were "local specialties" (usually some candy or cookie) on sale everywhere, and especially kids on school trips bought them by the box. I actually studied their marketing campaign in class one year; I have to say, it was pretty well awesome. That being said, I actually don't even like the regular Kit Kat bars, so I wouldn't expect the different flavored ones to be much better. the US has limited addition flavors. Mine was the coffee flavored kitkat. it was awesome. I had a green tea flavored one, and it was good. The melon flavored Hi-Chews are good as well. I loved your slip of the keyboard: "confectionery behemouth Nestlé"! So very appropriate. Bags of hard candy like the ones flavored like Mitsuya Cider, drink flavors you see in the soda machines and interesting herbal flavors can be found in a regular grocery store for ¥150-300. Has anyone seen Fanta Little Monsters promotion? I have a request from "home" to find Fanta Little Monsters. Toy "monters" that come with the drink? Is this promotion in the Tokyo area currently? Yeah, some of them are really good (Sakura Maccha Latte and Strawberry Tart were great!) and some are really foul. Like the wasabi one, urgh. I have yet to try my prefecture's specialties - one is apple, the other is seven spice. I should get my sister to report back on them since I sent her a couple of boxes. I wholeheartedly agree, Maki. 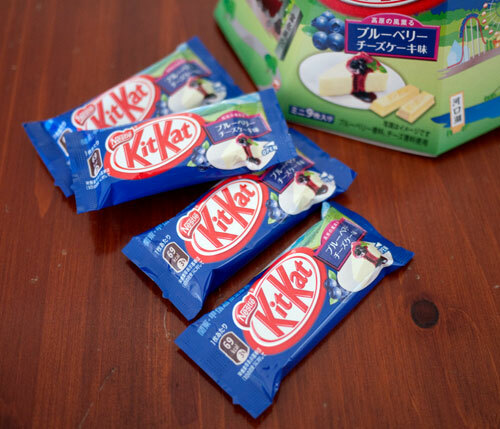 Last summer I picked up some "blueberry" flavored kit-kats and some "aloe yogurt" flavored bars at the local supermarket. I couldn't finish either bag. The blueberry kit-kats actually had a milk chocolate base and the addition of "blueberry" flavor was dreadful. The aloe yogurt were mildly better with a faint aloe taste over the cheap white mock-chocolate, but still inedible. Actually the only win I've found in the last year is the Zunda Mochi flavored kit-kats being sold in support of Sendai. Not bad at all, and a portion of the proceeds help disaster relief. While many of them do taste a bit off, and I agree it is a generic white chocolate base with flavorings, the novelty itself is the power. Think jelly bellys and the wide array of flavors, some quite nasty (popcorn??). Then consider the extreme they took this idea to in the Harry Potter movies (earwax, etc). Every year around Feb I would raid the 7-11s in Taiwan, looking for strawberry kit-kats. The concord grape ones weren't bad, but those strawberry ones, right around when the stores were flooded with strawberry season treats...WANT WANT WANT! 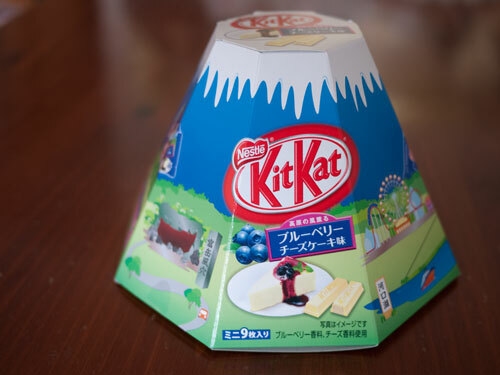 I WANT THAT FUJI-SAN SHAPED KIT KAT. According to a scientific study, blue is the most off putting color to eat so most food companies don't market blue anything. Although I am not usually a Kit Kat fan, while in Japan this Spring I found myself on the Great Kit Kat Hunt everywhere I went. Hojicha (roasted green tea) is my favorite hot drink, so I felt like I had really scored when I found the Hojicha flavored Kit Kats and ate one tiny one almost every night. For omiyage I brought back boxes of Yubari Melon and Wasabi Kit Kats. The melon was more fragrant that tasty. The wasabi was interesting, with just a little tingle. When we were at the airport to come home I spotted Sakura Kit Kats, but sadly, I was all out of yen and couldn't really justify pulling out the plastic. I actually really like Hershey's KitKat bar, but as far as I know, they only make chocolate ones. They make different sizes but all chocolate. And it's pretty good chocolate, not gourmet of course, but nice flavor and pretty good mouth melt. Even though they don't have the novelty appeal of the many flavored Nestle KitKats, maybe simple is better tasting in this case. Or Hershey's is just using better quality chocolate than Nestle. How interesting that KitKats comes in so many flavors. I am now so curious about this Japanese KitKats. I will look in my area for a Japanese Supermarket and see if they carry it too. I'm going to write something that will annoy all the British readers of this pages. I always thought that the chocolate in Kitkats ws at the lower end of the scale, then I moved to the UK after a few years in Switzerland (Swiss chocolate, do I need to add something) and in the Netherlands (where you can easily get super yummy Belgian chocolate). UK "chocolate", think the famous "buttons" and "roses" of a brand I won't mention, for me should not be called chocolate, as it contains other fats than cocoa butter. Of course if you grew up eating it it is "the chocolate", the one you got from your mum and granny, the one that you most fondly remember, and it tastes and feels as chocolate should. A bit sad, may be. Yes, you can buy "posh" chocolate that is actually edible over here, but even the humblest M-budget bar is far better that what is sold here as normal chocolate. And yes, the chocolate on the outside of KitKat is nicer too. There are even differences between the same brand and kind of chocolates. Chocolates are made specifically for a specific market, which means that for example a simple Lindt milk chocolate has a different taste and texture if made for the Swiss market or the German market or the UK market or the US market. This has to some extent the reason in market research, but also in local regulations. In some places, it is strictly verboten to use milk butter added to the coacoa butter, in other countries, it is allowed. This will already have an influence on the softening point, for example… etc. etc. I like blueberries on their own, or as jam (especially the real little wild ones) but added as a flavour they are very tricky, they develop a sour/stale/resinous aftertaste, almost solvent-like. Is it only my impression? PS: I found some orange-dark chocolate KitKat here, not bad, if a bit too sweet, a bit like a Jaffa cake KitKat. My favorite japanese "candy" is definitely the chamomile-honey-pear throat lozenges! Delicious :) way better than most you can find here in the US. Thank you for bringing back a wonderful memory. In a konbini somewhere between Tokyo and Utsunomyia I remember how excited all of my exchange group were to see flavoured kit kats. We bought every style we could find and then spent the rest of the jounery rating each one. I love the different flavoured and seasonal Kit Kats in Japan. Two favourites are Sakura (cherry blossom) and Ginger Beer. Your post made me go raid my pantry to check on my stash of flavored Kit Kats. Maple and Strawberry have been my favorites. Apple was pretty good too. The cheese flavored ones - not so much. Also, bread pudding - yuck! What I have run out of from my trip to Tokyo is Pure candy in the Yuzu flavor. We are passing through Tokyo again this year and my only 'must have' item to buy are as many bags of the Pure Yuzu candy that I can find. I've only had lemon vinegar. Sounds a bit gross, especially for someone who doesn't like the lemon + chocolate combo, but it was, well, okay. Not very interesting, though. To be honest I couldn't feel much of the 'vinegar' part, just 'lemon'. Completely agree. Have tried the blueberry cheesecake and wasabi flavours, and found them oversweet and flavourless. I had great hopes for the kinako flavoured kitkat (and it had nice packaging) but you couldn't discern any real kinako flavour. The rose-flavoured ones were also delish. Since moving to Japan I've been trying everything but KitKats. So far my favorite are Crunky Bars, but there are many more to try! Blueberry kitkats? Bleech. Blueberries are good but blueberry flavored stuff tasted really bad. There's like a Japanese convinience store in the US so I can buy Japanese stuff there. I tried several weird KitKats like the green tea and sakura one and it tasted just fine to me. And I tried wasabi and horse (yea there's a horse flavored ice cream. (lol wut)) flavored ice cream at my trip to Japan. Its disgusting. Ew. Hmm, are you sure it wasn't norseradish?